“Integration is the ultimate goal of our national community. We do not have to look very far to see the pernicious effects of a desegregated society that is not integrated. It leads to physical proximity without spiritual affinity. It gives us a society where elbows are together and hearts are apart. It gives us spatial togetherness and spiritual apartness.” Dr. Martin Luther King Jr. In October 2000, two friends, Philip Manuel (a renowned New Orleans jazz vocalist) and Michael Cowan (a Loyola University theologian), had an idea to create a genuinely integrated organization. They wondered … if they brought black and white people together to do something fun, and meaningful, and valuable, might they create an environment where at least this small group of people could begin to get past the personal segregation that exists in life in New Orleans and in America. So they each invited six friends who loved music, some black some white, to join a new gospel choir. And they convinced Al Bemiss, a highly respected New Orleans gospel choirmaster to direct the choir. As fate would have it, the first performance of Shades of Praise was scheduled for September 12, 2001. And so, on that day of mourning in America, this small choir became a voice of hope in their first public performance at historic Trinity Episcopal Church. Through rehearsals and performances, the members began to get to know one another. They shared needs and concerns, beliefs and hopes, fears and dreams. And under Bemiss’ instruction, Shades of Praise became a bit of a phenomenon in New Orleans. 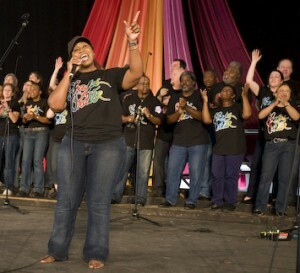 The choir became known for its joyous, high-energy, contemporary gospel sound. Audiences were visibly moved by the choir members’ obvious closeness … by this glimpse of what New Orleans could be. In addition to concerts at various churches around town, Shades of Praise began singing at the New Orleans Jazz & Heritage Festival. 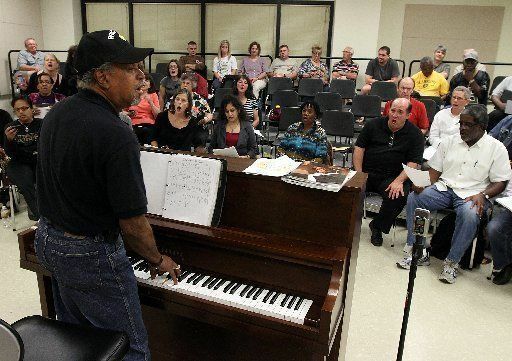 They were featured in the WWL TV promotion, nominated four times for the Big Easy Award in the Best Gospel Choir Category, and were at the center of a city-wide series of “Care Again” concerts, to facilitate public dialogue on race and promote harmony and diversity. All the while, the choir grew. By 2005, there were 60 members. Then Katrina struck … and the “Shades” were scattered to the winds. We didn’t know if we would ever see each other again. We didn’t even know if everyone was alive. But by then, we were family. And so like all scattered families from New Orleans, we began tracking each other down. We conducted an electronic “roll call” — documenting the location and situation of each member as they were found. We used text messaging, called known friends and relatives, searched in shelters. And finally, after weeks of anxiety, all the Shades were found. But the homes of 26 members had been flooded, and many more had lost their jobs. All of us were traumatized, displaced, scared, and uncertain what would happen next. And then a remarkable thing happened. When FEMA failed, when the City failed, when the State failed, we were able to help each other. We helped each other find apartments, we helped each other find jobs, we helped each other salvage possessions, and we raised money from friends and family around the country to help with expenses. Most importantly, we helped each other heal. As we slowly made our way back to New Orleans over the next several months, we healed each other with song, dance, hugs, and praise … as we gathered in increasingly larger numbers. Since then, many new Shades joined our ranks, adding important new energy and enthusiasm to our choir.